ENGLAND'S EMILY? at News Aboriginal Art Directory. View information about ENGLAND'S EMILY? 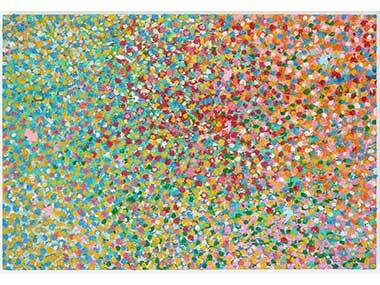 Which is which - Kngwarreye or Hirst?? The answer is below! Poor old Emily.....first there was the Qantas plane named after her with an artwork that didn't look like her's, and now Damien Hirst. Much puffing and blowing has occurred since images of the once-YBA Hirst's 'Veil Paintings' first appeared in public for a show that's just closed in Los Angeles. 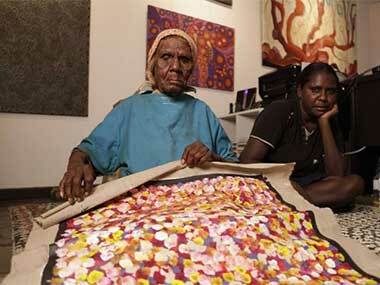 They certainly have the layered dotting that was pretty much invented by Emily Kngwarreye in 1990 and '91. But to the expert eye, that's about it for similarity. So I have to say that the art of Emily Kngwarreye and her successors may have lain in the back of his mind when 'Veiling', but his failure to match her (or Bonnard's) extraordinary colour sense or, in long-time Utopia art dealer, Chris Hodges's mind, achieve the 3D depth that she could with her multiple layers of dotting, suggests no actual copying. 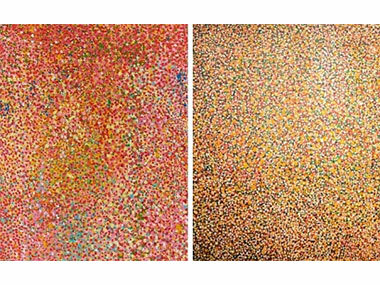 “She had a technique I call shifting layers”, explained Hodges, “that Damien hasn't achieved as far as I can see.” But what a joy that he's moved on from the mechanical production of sporadic dots employed in his 'Spot Paintings' and the blodgy patches of colour that also had a hint of Aboriginal art in the 1990s 'Visual Candy' series. He proudly told The New York Times that he painted each work exclusively himself this time! But now he's clouded the waters further in a filmed chat with the elderly artist, Peter Blake. "All my ideas are stolen anyway," Hirst casually, but unabashedly comments. While studying art, he was apparently told, ‘Don’t borrow ideas, steal them’ by Goldsmiths academic Michael Craig-Martin, who was probably thinking of the quote ‘good artists copy; great artists steal’, commonly attributed to Picasso. "That was when you realise you don’t have to be original," Hirst says in the film. "Nothing is original – it’s what you do with it," adds Sir Peter Blake . There's no doubt that anyone seeking originality would buy Emily! But, as the art world is more about investment than connoisseurship, Damien's 24 paintings sold out in LA at prices ranging from $US500,000 to $US1.7 million, bought by the likes of Kanye West, Miranda Kerr, Michael Douglas, and movie producer Brian Glazer, “who mingled with leading lights from art and fashion such as David Hockney, Ed Ruscha, Frank Gehry, Tom Ford, Calvin Klein and Vera Wang”. 'The Veil' series grossed an estimated $US18 million. Amazing what you can get for pretty surfaces. Which brought to mind the comments of Emily's niece, Barbara Weir, who retorted to a journalist when she was shown Damien's work: “Utopia artists layer their work with meaning. The painting [we're] talking about has been passed down by Emily's father, the same with Polly Ngale, my aunt. It's not a made-up one, it's a very important story." Art dealer and President of the Aboriginal Art Association of Australia, Adam Knight, pointed out that Australia's fragile Indigenous art industry was the most successful enterprise in remote communities. And he's planning a riposte to Damien Hirst. New York’s Olsen Gruin Gallery will show an exhibition he's organising in response to the controversy, featuring work by artists Kathy Maringka, Polly Ngale and Gabriella Possum Nungurrayi.